Ange-Joseph Antoine Roux, "Antoine Roux" (1765–1835) was a French marine artist famous for his watercolor ship portraits created during the most epic time of the sailing ship era. He was born March 5, 1765 I Marseille, France, to Joseph Roux and Marie-Ursule Demoline. Antoine grew up in his father’s hydrographic shop where he picked up his nautical knowledge. The earliest known his work is a sketch from 1787, signed and dated, showing pieces of a man-of-war. Later sketchbooks are in collection at the Peabody Essex Museum. He became very popular for the accuracy in ship’s depiction ad the way he made them seem alive. No wonder, ship owners and captains were egger to entrust him with creating paintings of their ships. 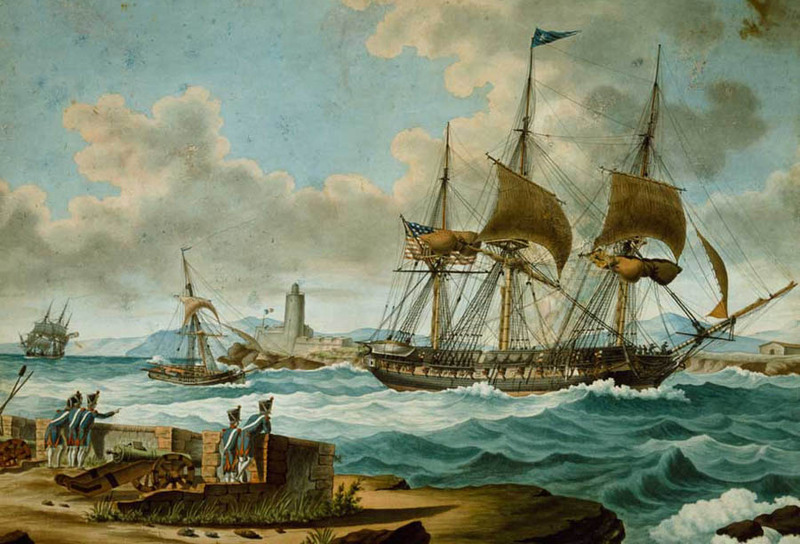 He portrayed ships of every nation visiting Marseille during decades, including many United States navy and merchant ships. His creations are invaluable original source of the knowledge about old sailing ships. For the most part Antoine’s style remained the same, especially when it came to hulls and rigging, which he depicted with excellent skill. One area that changed was his depiction of water. It was around 1805-1806 that he stopped illustrating waves so formally with high-crested wavelets, except in the instance of rough seas, and replaced them with softer and more natural looking waves. 1825-1835 “Ante [or Antne”] Roux père à Marseille” Antoine died April 20, 1835 from Cholera. He continued to paint and work in the hydrographic shop up until his death. All Antoine's four children followed in his artistic footsteps, with his three sons becoming known for their painting as well: Mathieu-Antoine Roux (1799-1872); François Joseph Frédéric Roux (1805–1870), 'Frédéric', was apprenticed to Horace Vernet; and the third, Francois Geoffroy Roux (1811–1882), 'François', was appointed in 1876 as an official Peinter de la Marine.